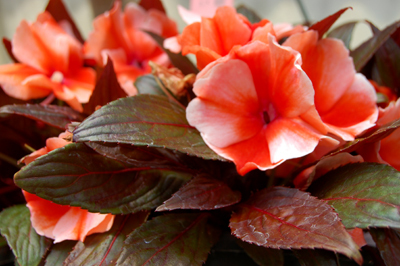 Impatiens have beautiful, bright flowers that are perfect to enjoy as outdoor annuals in warm months and indoor houseplants year round. There are a multitude of types, varieties and colors to choose from. 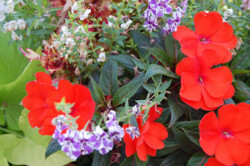 Outdoors Impatiens are commonly placed in borders and along edges of areas that are fully or partially shaded. 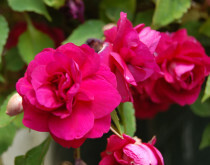 They do best in fertile, well-drained soil and they require regular fertilizing to keep blooming from spring to fall. They grow vigorously and require daily watering. Impatiens are often used outdoors in hanging baskets or pots that can easily be brought indoors and work beautifully as a houseplant. Impatiens that are in the ground can be easily dug up and replanted in a pot or they can be cultivated from a cutting from the plant. Indoors Impatiens need plenty of bright light, but not direct sun. They like cool, but not cold, temperatures, so make sure they are placed where the temperature is 60° or higher and no lower than 55° at night. Keep them moist — daily watering may be necessary if the air is dry. 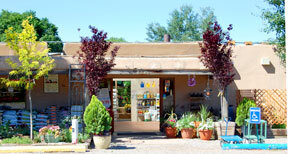 Occasional misting is good, but avoid spraying the open blooms. Young plants should have their tips pinched off several times to encourage branching. 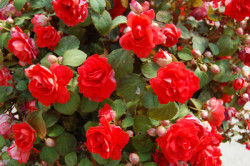 Plants that are slightly potbound will produce more blossoms. Distinguishing Characteristics: Vigorous and well branded.